Companion mod for OMT, adds hard blocks, walls and fences. Depends on OMLib. 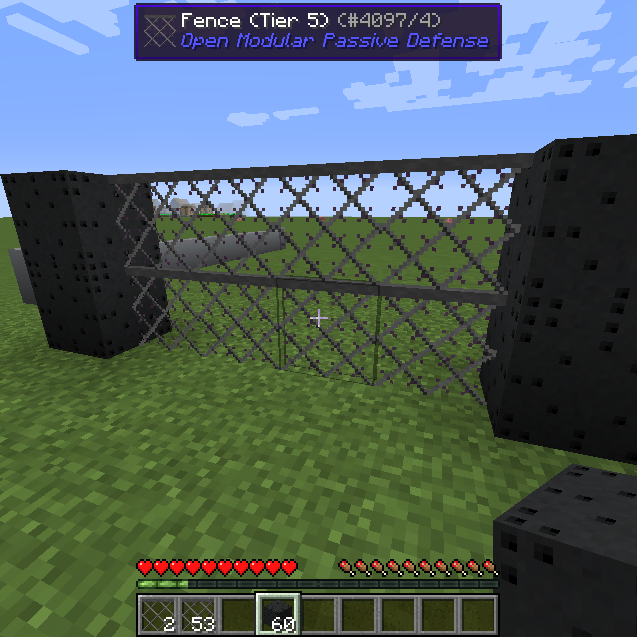 You most likely know the blocks and fences from the 1.7.10 version of OpenModularTurrets. These are now in their own mod and got some unique new features: They are owned, and their owner can break those blocks instantly (now via shift-rightclicking with an empty hand, later with a tool from OMLib). Also the owner does not get damage from his own fences. If you have any more ideas for the mod please feel free to post them at the issue tracker. new Block that detects and highlights mobs. Permission to use this mod in my modpack? Is there a whitelist for friends? Agreed, electric fences are cool. Sure, we can use iron bars and IE wires for electric fences now, but it's not as cool. Can you give an actual list of the blocks added in this mod? We could probably add a wither-proof block, too. can you add barbed wire? Ummm... im not sure if u change the name or this is the mod? Hey, just a suggestion, but perhaps doors that go with the fences? That way I could set up a fence around my house, but still be able to, y'know, leave it. hmm.. maybe the new lights; that of the floor style lights, will they be projecting light forward or in a ll directions like standard light sources? if they project light forward like real world floodlights then i have an idea to add tot hat feature; have it cast 5 seconds of blindness on any target that gets caught directly in its beam at night (within a set distance of the source block of course due to game mechanics being so limiting on certain things.). oh, i suppose now that i think of it, motion senor devices that can be hooked up to other things might a good add-in too, i mean i know we got trip wipes but those are so easy to disarm, at least with its own motion sensor device to detect movements, plays can make redstone traps and other devices still be triggered without other players being able to easily disarm them. We have a new project called Open Modular Lighting, still in planning phase though. I promise this when I mean I'm not trying to promote anything but I'm working on a remaster of the invasion mod that has a passive mode where certain mobs will by default be able to slowly break blocks (speed depending on hardness) if they've detected you. Then yes, it should work.